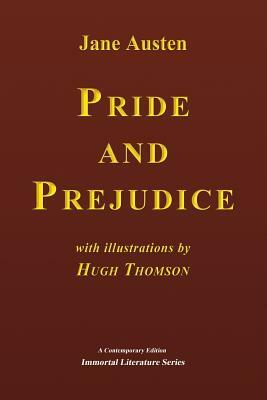 This is a new edition of "Pride and Prejudice," originally published in 1894 by George Allen, of London, England, with a postface by George Saintsbury and illustrations by Hugh Thomson. Part of the project Immortal Literature Series of classic literature, this is a new edition of the classic work published in 1894-not a facsimile reprint. Obvious typographical errors have been carefully corrected and the entire text has been reset and redesigned by Pen House Editions to enhance readability, while respecting the original edition. Jane Austen's Pride and Prejudice is perhaps one of the finest and most popular novels ever written. It tells the story of Elizabeth Bennet and her family in nineteenth-century England. Elizabeth has four sisters, and the dream and main object of their mother's life is to marry them off well. The reader will be delighted with this romantic suspense and with Austen's elegant narrative style-the transition between narrative voices, her direct commentary-as well as with the story's fascinating characters and their social interactions. About the Author: Jane Austen (1775-1817) was an English novelist whose seminal works, inspired by her own upbringing as well as in the landed gentry, have influenced successive generations. She was the seventh child-out of eight-and second daughter of Cassandra (n e Leigh) and the Reverend George Austen. She was born on December 16, 1775, in Steventon, Hampshire, England. Her parents were well-respected middle-class community members. Her father was the local Anglican clergyman and supplemented the family income by taking private pupils in the family home and parsonage. Her mother, Cassandra Leigh Austen, came from an aristocratic family and influenced Jane's sense of social class and self-worth. When they were young, Jane and her six brothers and sister were encouraged to read from their father's extensive library. With a romantic vein, but nevertheless a realist-known for her style and ironic humor as well as for her fascinating depiction of women's domestic roles of the early nineteenth century-Austen wrote "Sense and Sensibility" (1811), "Pride and Prejudice" (1813), "Mansfield Park" (1814), "Emma" (1815), "Northanger Abbey" (1817), and "Persuasion" (1818), all of which replete with memorable protagonists-including Elizabeth Bennet, in Pride and Prejudice. Jane Austen (1775-1817) was an English novelist whose seminal works, inspired by her own upbringing as well as in the landed gentry, have influenced successive generations. She was the seventh child-out of eight-and second daughter of Cassandra (nee Leigh) and the Reverend George Austen. She was born on December 16, 1775, in Steventon, Hampshire, England. Her parents were well-respected middle-class community members. Her father was the local Anglican clergyman and supplemented the family income by taking private pupils in the family home and parsonage. Her mother, Cassandra Leigh Austen, came from an aristocratic family and influenced Jane's sense of social class and self-worth. When they were young, Jane and her six brothers and sister were encouraged to read from their father's extensive library. With a romantic vein, but nevertheless a realist-known for her style and ironic humor as well as for her fascinating depiction of women's domestic roles of the early nineteenth century-Austen wrote "Sense and Sensibility" (1811), "Pride and Prejudice" (1813), "Mansfield Park" (1814), "Emma" (1815), "Northanger Abbey" (1817), and "Persuasion" (1818), all of which replete with memorable protagonists-including Elizabeth Bennet, in Pride and Prejudice.